You Might not realise this but most children will never get to try their hand at Martial Arts and the reason for this is down to the parents. As parents we are often working long hours, paying over priced bills and at the end of the evening we certainly don’t want to take our kids to the local martial arts class. The sad thing about this is that if parents understood the value that good martial arts training can bring to a child’s life and education then all parents would be queuing up to get their children signed up for martial arts training. It is far too easy to dismiss martial arts as an ‘activity’ because it is so much more than that. It is more than sport, more than self defence and I have picked out 10 reasons you should take your child to martial arts lessons to help you understand the power of the arts. Go to any martial arts class and you will see a form of respect. Often this is a bow, a handshake or salute. This is the very first thing your child will learn at a class and in many ways is the most important lesson. The bow (or other method) is a sign of respect and most children will never have done this prior to their first martial arts class. Children dont shake hands, they have little understanding for the word ‘respect’ and ‘dignity’ until they get much older. Yet if you do go to a martial arts lesson you will see 5 year olds showing ‘respect’ for their training partners by bowing to each other. This process is often overlooked by the casual observer but the bow teaches a child to treat others with respect and dignity. Some of you may not believe this simple gesture can achieve all of this, however the bow, handshake or even a touch of gloves is a symbol that shows the other person and the class that your child embraces the concepts of sportsmanship, respect and dignity. It is a way of saying ‘thanks for a good practise’ an also a way of showing mutual respect. It doesnt matter what race, gender or background they have. Because the dojo is a place for respect, we are all equals there. The human body is capable of so much yet we are now well and truly in a society battle against obesity. Children are overweight and can go from sitting at a school table to sitting on a school bench to sitting at home. 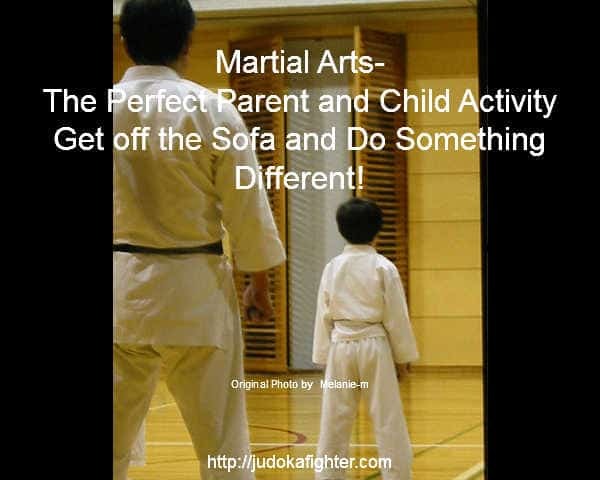 This isnt fiction but the truth, however martial arts allow a child to become physically creative with their bodies. They will learn that they are far more able than they first believe and soon will master movements such as forward rolls, handstands, throws and other techniques which will leave adults bewildered at ‘how’ a child can do such things. However this will stretch not only the physical but the intellectual muscles as the child has to learn new movements and techniques. Trust me its an amazing process. Get thrown 9 times and get up 10. Thats Judo and Jiu Jitsu for you, take a punch and keep moving forward. Get pinned and learn to escape. The martial arts reflects life in so many ways but the one thing that martial arts will teach your child is to never give up because nothing happens without hard work. This is the over riding message of the martial arts. You wont get the coveted black belt unless you train with commitment, heart and desire. Just as in life you will never be given anything for nothing, you have to work hard and earn your rewards. The martial arts teach your child this and there will be set backs, there will be tears and there will be defeats. But your child will learn to overcome them. Its a tough world, and very often your child will have limited things to feel proud of. The martial arts provide another route to develop pride in themselves and their achievements. This is not the same as boasting or bragging. Your child will earn a grade or a belt, no matter the colour and they will rightfully feel pride! Its a great feeling and something we need to encourage in all children. According to the National Bullying Survey, more than half of those who reported being bullied had been physically hurt (parents report over 71%); 34% of those physically hurt required attention from a doctor or hospital. 3% of the attacks involved a weapon. So Self defence skills are essential in the modern world. Each week your child will bond and make friends outside of their classroom. Developing key social skills your child will be able to meet new people and also have fun at the same time. A lot of martial arts clubs have a huge social scene and being part of this is an amazing feeling. Friends in martial arts are friends for life. That all important skill. Concentration. Yes children struggle with this but by regular martial arts training you will see improvements. It happens as the child has to replicate movements and techniques and without concentration they simply cant do this. Think about school, you always tried harder when you were told by the teacher they would be asking questions the next day. Well in martial arts the questions are asked instantly so you have an immediate feedback loop. This forces the child to focus and develop that concentration. Your child will have balance in their life. Now I do not mean the physical sense, although they will get this from martial arts. I am talking about the emotional balance of a child. For most children they dont have this, martial arts is a great leveller. There are always people in class that are a bit faster, a bit stronger or a bit better, and as martial arts is about being the best you can be your child will learn that they have strengths and weaknesses and so does everyone. It is very rare to find a cocky martial artist beacsue the activity itself brings balance to a child. The hardest thing in martial arts is actually walking into a club. Then you will gulp when you have to spar, you will shake and have sleepless nights over your gradings. Yet when others would quite and not bother to go through the door the martial artist has the courage to face their fear and go through with it. There are so many moments of fear in life, learning to deal with your fear and use courage is a gift every child can benefit from. And finally leadership. As your child grows in the martial art you will see them start to be a leader. This begins by taking a warm up, then holding the pads for the younger students to eventually running drills and games. It wont happen overnight but in a few short years your child will slowly grow in their leadership skills. So How do I know the above? I have been involved in the arts for years and have seen these things happen for myself. Do yourself and your child a favour and get your child into martial arts classes today.